Use this table to find batteries, then use the comparators to check and compare them. 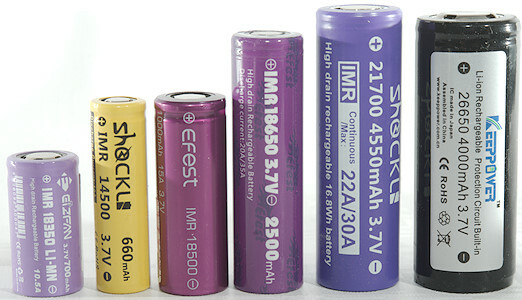 This table contains all the LiIon battery sizes and chemistries. It is not always possible to see if a battery is good or bad or there are something special about it, it is always recommended to check the review. The check boxes in the green field is used to show/hide columns. This table has many columns, to keep the overview it is best only to check one in each group, except one. I.e. Multiple current, single voltage and mAh or mWh, it could also be Single current, multiple voltages and and mAh or mWh. But do not try to use multiple currents and multiple voltages at the same time, the table gets really messy when doing that. Click on a header to sort ascending or descending, with the filters use CTRL-click to select multiple values in a column. Filters and sorting also works when column is hidden.